News | Oakbourne Construction Ltd.
Oakbourne install new tunnelling / caving complex, shooting range plinth, disabled ramp and car park drainage channels for Cranham Scouts. Oakbourne start work on new Kier project to build extension to the existing City of Bristol College to provide additional area at the Advance Engineering Centre. Subcontractor Award Winner! Oakbourne Construction have been announced as Kier’s Subcontractor of the Quarter for the period Oct-Dec 2016. This award acknowledges the high standards for SHE Management demonstrated on site at Cheltenham Ladies’ College, building a new Health & Fitness Centre. It is the fourth time Oakbourne have won the Kier Subcontractor of the Quarter Award and follows successive zero non-compliance reports from the Building Safety Group’s site inspections. 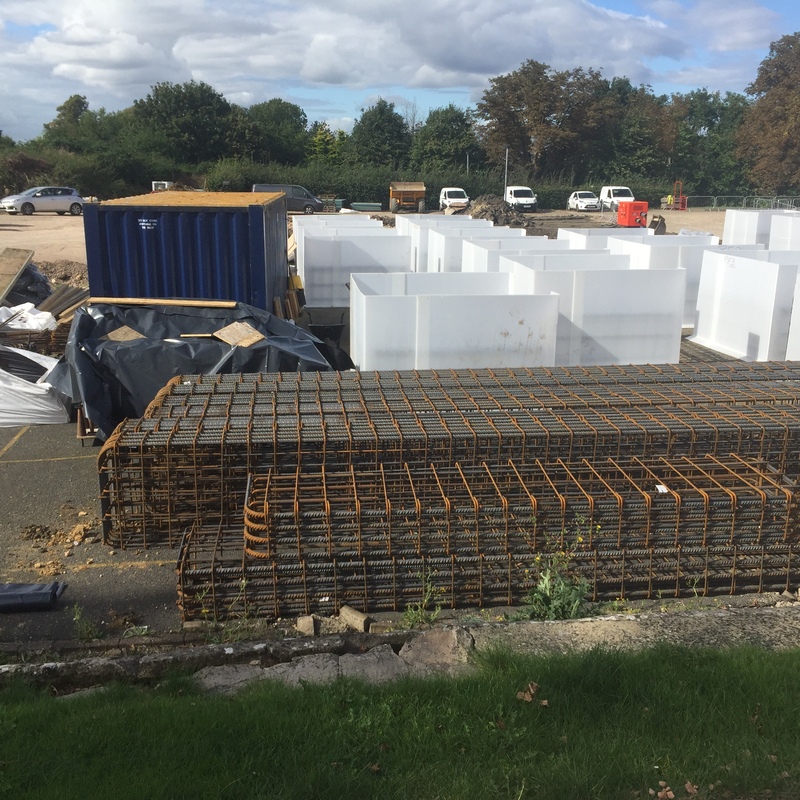 “This is a very well run site with attention paid to detail and planning ahead.” comments The Building Safety Group and reports zero non-compliances for Oakbourne work on new Health & Fitness Centre at Cheltenham Ladies College. 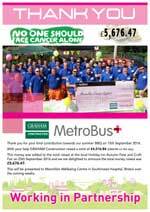 Oakbourne supports GRAHAM Construction’s fundraising day for Macmillan Cancer Support on the M32 MetroBus Project in Bristol. Click here for the ‘Thank You’ poster with some further information and a team photo which was taken on the day. 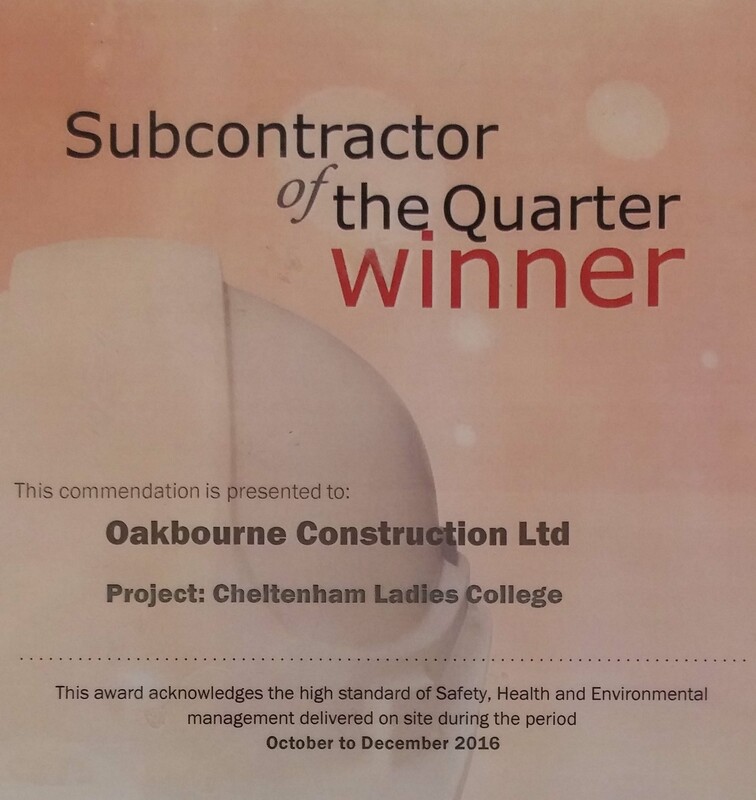 The Building Safety Group Site Health & Safety, Environmental and Welfare Reports zero non-compliances for Oakbourne work at Cheltenham Ladies College. 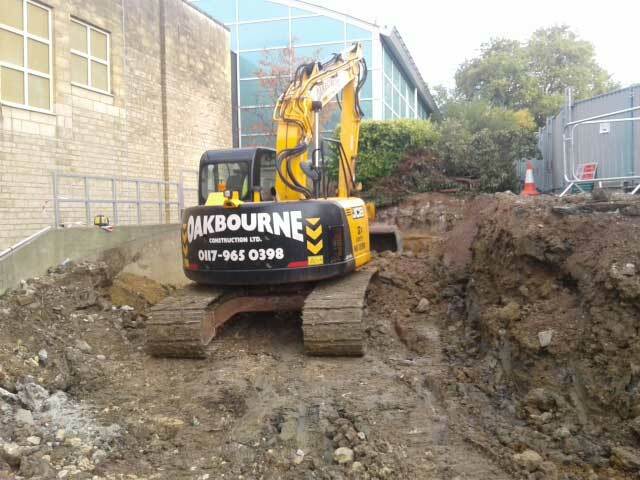 Oakbourne start work on new Kier project to build a new health & fitness centre for Cheltenham Ladies College. 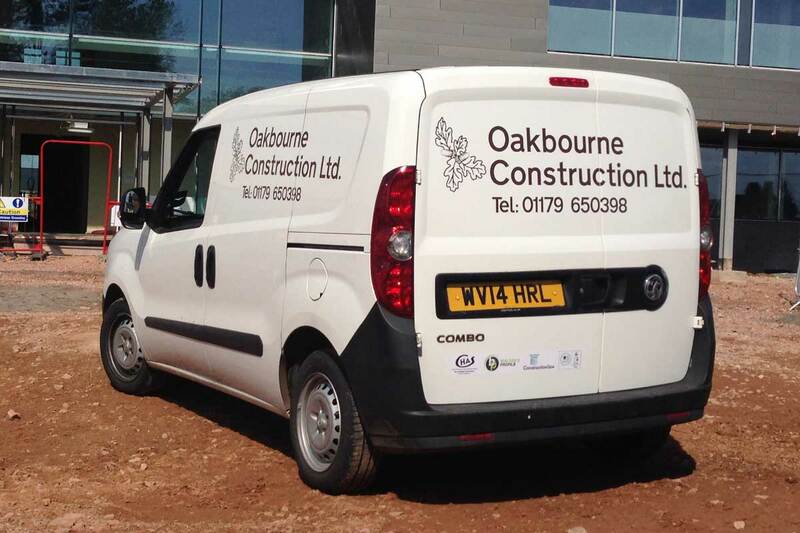 Oakbourne Construction are subcontracted to carry out the groundworks and associated works. “Work being carried out safely and housekeeping was good.” comments The Building Safety Group and reports zero non-compliances for Oakbourne work on Gracewell Care Home, Bath. The Building Safety Group Site Health & Safety, Environmental and Welfare Reports zero non-compliances for Oakbourne work on Factory Units at Tall Trees Estate, Cirencester. 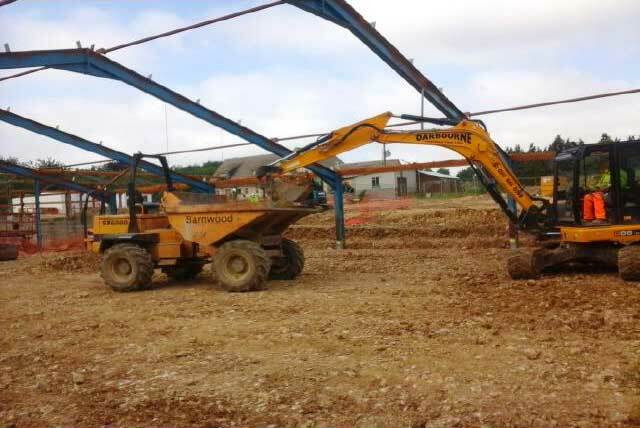 Oakbourne start work on new Barnwood project to convert existing barn units into factory units with all associated groundworks and services at the Tall Trees Estate, Cirencester. 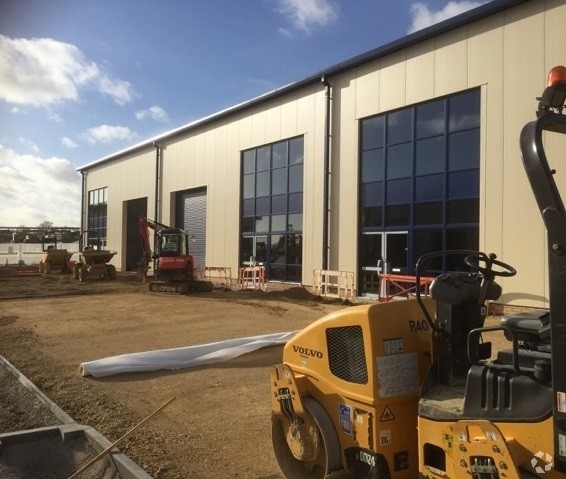 Oakbourne complete work for ISG at Dyson factory, Malmesbury. The Building Safety Group Site Health & Safety, Environmental and Welfare Reports zero non-compliances for Oakbourne work at M32 MetroBus Junction, Bristol project. The Building Safety Group Site Health & Safety, Environmental and Welfare Reports zero non-compliances for Oakbourne work at St James Court, Almondsbury project. Oakbourne begin auto-enrolment of employees into company pension scheme. Oakbourne Environmental Management System inspected and certified BS8555 Phase 5 compliant. “Very good commitment was again demonstrated by the management in maintaining the EMS. The organisation has met the criteria of Phase 5. Staff awareness (where tested) was very good and knowledge of the EMS and environmental issues, such as pollution prevention, waste segregation and legislation were demonstrated. The major aspects identified were addressed by appropriate control measures and objectives & targets. Very good use of the data acquired was evident. The activities at the office, workshop and the (sampled) construction site were extremely well controlled, with good waste management and protection of sensitive receptors.” Click here for a copy of our certificate of environmental management. The Building Safety Group Site Health & Safety, Environmental and Welfare Reports zero non-compliances for Oakbourne work at Aquarious Centre, Gloucester project for new construction of steel frame building and comments: “Oakbourne works are well managed with company procedure and policy arrangements being followed under the supervision of the supervisor regarding plant inspections and maintenance, safe working methods and arrangements for protection of operatives during work activities eg HAVS & Noise.”. Oakbourne attend Working Well Together “Breaking Ground” – 7 Safe Steps Event at the National Self Build & Renovation Centre in Swindon. Oakbourne carry-out annual Environmental Management System Review & Audit. Quarterly Health, Safety & Environmental Committee Meeting held at the Holiday Inn, Swindon. The Building Safety Group Site Health & Safety, Environmental and Welfare Reports zero non-compliances for the enabling works at University of Gloucestershire’s Pittville Campus in Cheltenham and comments: “Site appears well run and activities safely planned and carried out”. Oakbourne renews Constructionline and Builder’s Profile memberships. Oakbourne pass assessment for renewal of CHAS accreditation. Oakbourne begin the enabling works for development of University of Gloucestershire’s Pittville Campus in Cheltenham. The Building Safety Group Site Health & Safety, Environmental and Welfare Reports “Operatives were working safely on site and maintaining good housekeeping. No issues to raise during the visit.” for our work on the Gracewell Care Home project in Bath. Congratulations to Bishop Fleming who raised over £27,500 for local charities through their Tour of BF cycle event which we were pleased to make a donation towards. Click here for their short video on the event. Oakbourne are presented with the Highly Commended BSG Environmental Award as runners-up in this category in respect of the successful implementation of our bespoke Environmental Management System achieving BS8555 Phase 5 Accreditation – “a fantastic achievement given the relative size of this company”. 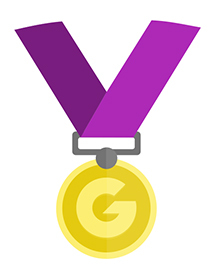 Visit http://www.bsgltd.co.uk/bsg-awards-2015 for further details of the event and click here to view a copy of our Certificate Of Excellence. 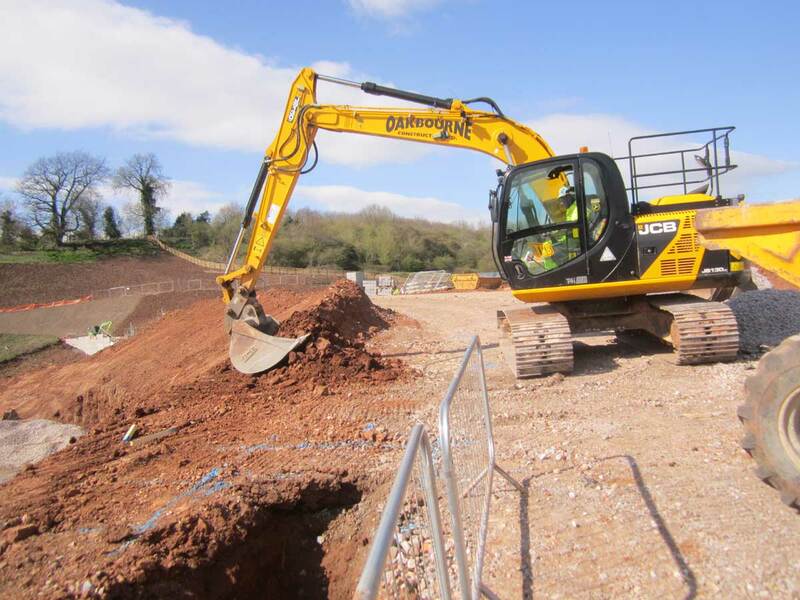 Oakbourne start work on new project carrying out the drainage works on a new build of 6 retail units being constructed by Key Projects at Shipston-on-Stour. The Building Safety Group Site Health & Safety, Environmental and Welfare Reports for our work on the Gracewell Care Home project in Bath and the Horizon Nuclear Power Office HQ at Plot 1420, Gloucester Business Park reported no issues and commented that they were “well managed and supervised with banksmen in attendance for current plant movements as observed” and “Operatives were working safely on site and the work areas kept tidy”. Oakbourne attend the Utility Strike Avoidance Group Conference at Heathrow Academy. Completion of works at Swindon Academy. 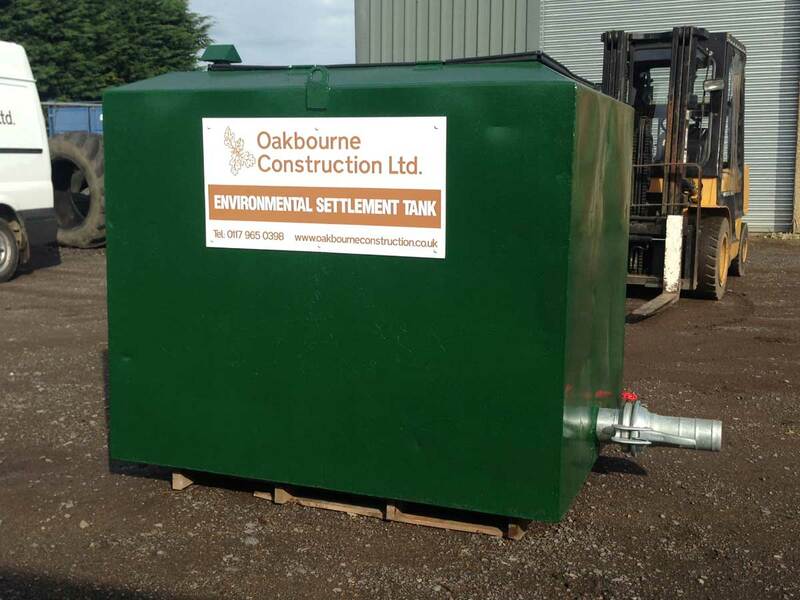 Steve Wilson completes filtration tank recycled from old diesel storage tank. The awards ceremony takes place on Tuesday October 6th at the Williams F1 Conference Centre in Wantage, Oxfordshire. Commencement of works on new build Gracewell Luxury Care Home in Bath. Commencement of works at Swindon Academy. 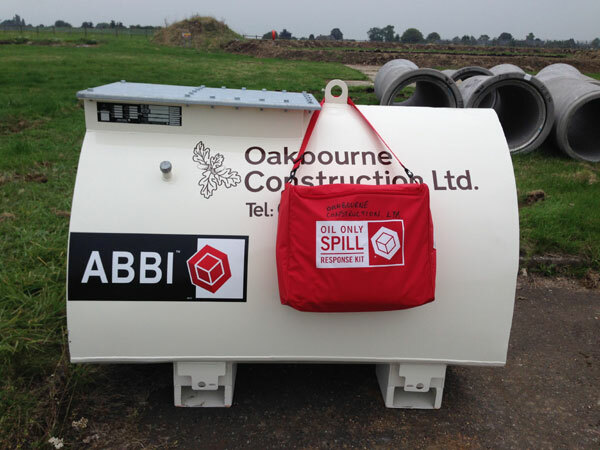 Oakbourne signs up to the USAG Safe Digging Charter. Click here to view charter declaration. Oakbourne Construction supports the Yorkshire Dales Millennium Trust carbon offsetting initiative to help reduce the UK’s carbon footprint. The YDMT has planted 15,522 trees so far as a result of the EcoPoint fuel card programme. Over the next 100 years, these trees will offset approximately 5,970 tonnes of carbon. Click here to view our Certificate Of Sustainability. Oakbourne attend the Willmott Dixon Supply Chain Seminar at the Arnolfini, Bristol. New van livery featuring membership and accreditation logos for CHAS, Builder’s Profile, Constructionline and level 5 BS8555 Environmental Management fitted to Oakbourne vehicle fleet. Completion of Premier Inn, Basingstoke project (Project Ref:C283, Leisure Sector). This was a technically challenging project in the city centre and has been completed on time and to a high standard. “Oakbourne Construction completed the project on time to a very high standard, and are a credit to the industry” – Steve Dixon, Site Manager, Barnwood Construction, Premier Inn, Basingstoke. Oakbourne Construction come top in Hercules Site Audit on Large Temporary Gas Oil Storage at MoD Lyneham. We support Kier’s Moss Mountaineers 2015 Challenge by donating to their chosen charity for the Great Western Air Ambulance Charity. Good luck to all the team, hope you have a great day! We support the Kier W&W Directors Challenge aiming to raise £10,000 for Macmillan Cancer Support by donating at https://www.justgiving.com/kierdirectorschallenge – Good Luck to you all from Oakbourne Construction Ltd.
A big thank you to Kier, BAM & Willmott Dixon for their help and support in providing many of the completed project photos featured on our new website. Click here to view our projects gallery. Oakbourne sponsor Lydiard Youth Football Club, a local Swindon Football Team managed by Supervisor Steve Tooze, by donating towards training kit. 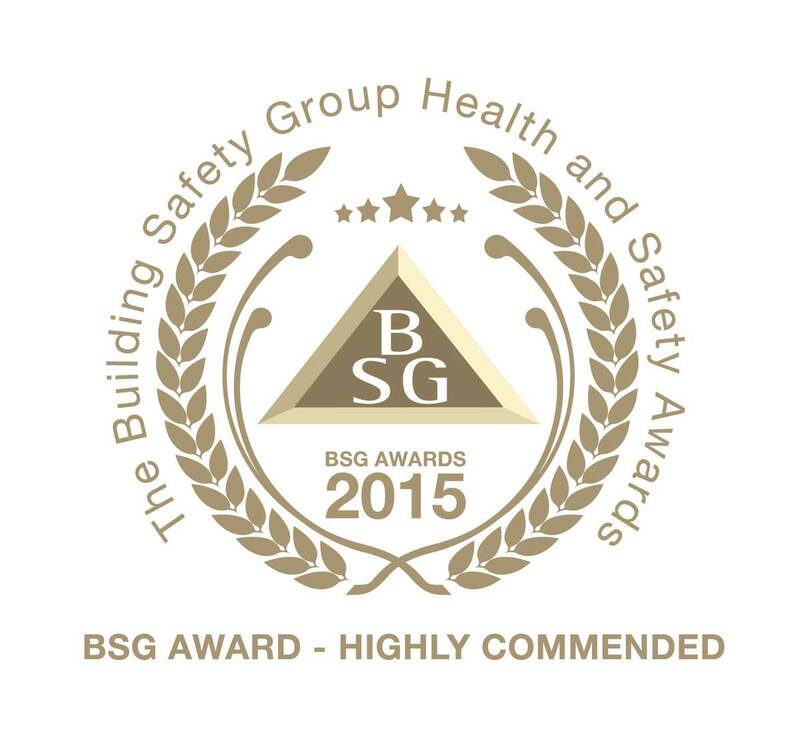 Oakbourne Construction confirmed as The Building Safety Group Awards Nominee for BSG Member of the Year for the Best Practice in Health, Safety and Environmental Welfare and the BSG Environmental Award. All staff trained on the safe use of excavator quick hitch devices. All staff trained on emergency spill response procedures. Oakbourne Construction new Hand Arm Vibration Management System rolled out which is designed to be effective, easily understood and workable. Latest modern low vibration pneumatic breakers purchased together with HAVi and pnuematic tool meters. Congratulations to Carl he was awarded an NVQ for operating a Ride on Roller. Subcontractor of the Quarter Winner! We’re proud to have been awarded Subcontractor of the Quarter Winner for health, safety and environmental management for the period January to March 2015 by Kier Construction for our work on our current project at Plot 1420, Gloucester Business Park. Click here to view our certificate. Also congratulations to the Kier site team on this project which won the Site of the Quarter Award. We support the Willmott Dixon Foundation in undertaking the Cyclotour du Leman for details of the charity challenge see https://www.justgiving.com/WDCyclotourchallenge The challenge is on the 24th May and proceeds will be donated to the Stoke Mandaville Trust where the Group Safety Inspector Steve Thomason is being treated for spinal injuries. New design for company headed paper went into print. Launch of company website – we hope you like it and would value your feedback! 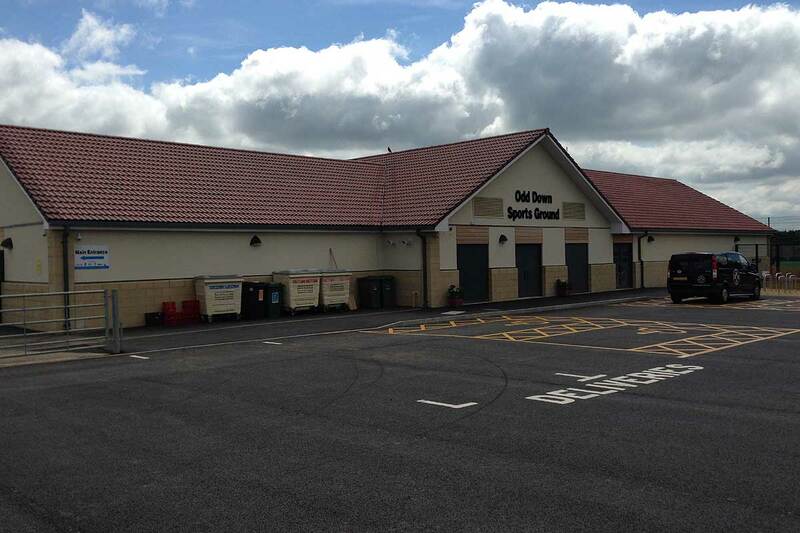 Completion of Odd Down Sports Pavilion in Bath for Kier Western. Congratulations to Tom and Tony on renewing their Streetworks Operatives Licences with Sanctus Training Ltd.
Congratulations to Liam for adding CPCS Lifting Operations Module for his 360 degree excavator card. We are proud to announce that Oakbourne Construction has reached Silver status membership of the Supply Chain Sustainability School further demonstrating our commitment to delivering environmental and socially responsible sustainable construction solutions. We attended the Working Well Together Famous Five Event at Swindon Self-build and Renovation Centre on occupational health. Congratulations to Carl and Kimberley on birth of their first baby, Archie. Nice shiny new 6t Thwaites Dumper purchased for MOD Lyneham site. Steve and Justin attend HSE one day first aid course with Sanctus Training Ltd.
We are proud to announce that Oakbourne Construction has been awarded Phase 5 of British Standard 8555 for Environmental Management after independent inspection by Tarian Inspection Services. As part of our move towards a more sustainable business model we enrol in a carbon offsetting scheme, all the carbon emissions generated by our company vehicles transporting our workforce to and from site will be offset by tree planting by the Yorkshire Dales Millennium trust. Purchase of new Global Western diesel storage tank conforming to latest environmental regulations for MOD Lyneham site. This completes our program of replacing all our old diesel tanks for modern high quality, secure and environmentally compliant tanks. Purchase of new JCB JZ140 360 degree excavator for MOD Lyneham site. Operator Fred is very pleased with his new excavator. We are proud to announce that Oakbourne Construction has been approved for membership of Constructionline the register of pre-qualified suppliers for public and private sector procurement. Staff Health & Safety Training Days on Saturday 17th & Saturday 24th. Many thanks to Angela at Sanctus Training Ltd for working the weekends and providing excellent high quality training on noise, dermatitis, HAV, silicosis and manual handling. 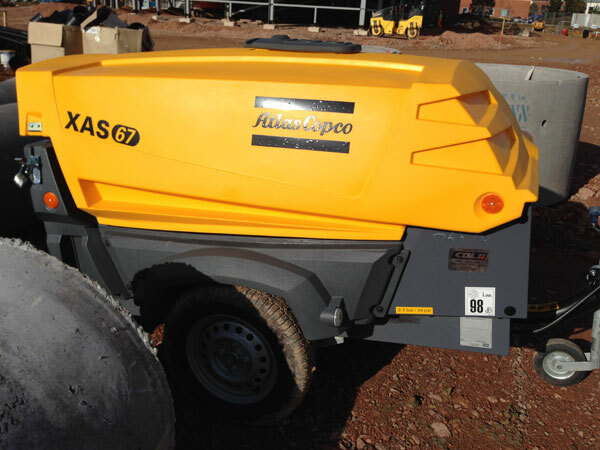 New Atlas XAS 67Kd compressor purchased for Plot 1420 Gloucester Business Park. New Radio-detection CAT4+ with data logging and genny purchased from Phoenix Surveying Equipment Ltd. This completed our programme of equipping each of our Supervisors with the latest cable detection equipment. Mr Adam Baker also kindly carried out further additional training on the CAT4+ on all of our current sites, this was on top of the full training course he carried out with us in 2014. We are pleased to welcome Rhys Dixon to Oakbourne Construction. Rhys is 17 years old and lives near our site at Gloucester Business Park. We would like to thank the Kier Construction site team for their encouragement and support in recruiting a young person and employing them on the site. This also demonstrates our commitment to investing and developing skills in young people. We are pleased to announce that Oakbourne Construction has renewed Premium Membership of Builder’s Profile online pre-qualification data exchange service. We are pleased to announce Oakbourne Construction has renewed accreditation with the Construction Health & Safety Assessment Scheme (CHAS). Submission of CITB Training and Development Plan for 2015. We are pleased to welcome Simon Littlechild to Oakbourne Construction. Simon has been a company director operating in the education and training industry and brings qualifications and many years experience in business studies and administration.